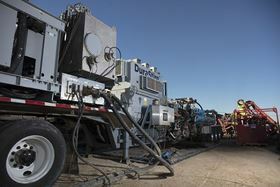 AFGlobal has completed field evaluation of its DuraStim® pump with ProPetro Holding Corp in the Permian Basin. The trial, which began last month, followed five years of design and engineering, and significant in-house testing. Designed by AFGlobal’s Pressure Pumping Technologies group, the DuraStim frac pump, at 6000 HP, offers the equivalent of three times the effective horsepower of a conventional frac unit, while operating at approximately 10% of the cyclic rate. The new patented pressure pumping technology offers many advantages, including more than a 65% reduction in fleet footprint and manpower, while extending equipment life and reducing maintenance costs. AFGlobal will initially offer the system for sale with an electric direct drive. The company expects to provide interested customers with a turbine-direct drive system later in 2019, as well as a 3000 HP diesel system later in 2019 or early 2020. The system will also offer a cloud-enabled control system to optimize the distribution of information and predictive maintenance to improve operational efficiencies. “In keeping with our history of innovation and new technology development, we are excited to launch this unique pumping system, bringing the first true game-changing technology to the market in more than three decades,” said Curtis Samford, president and CEO of AFGlobal. AFGlobal expects to begin taking orders for DuraStim pumps in January 2019, for deliveries starting later in the second quarter.